Make this masterful sandwich from leftover juicy steak mixed with barbecue sauce. 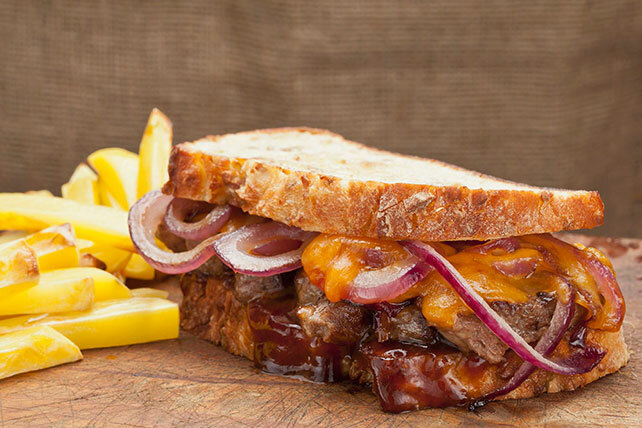 The tender steak, soft red onions and creamy cheddar are ideal companions in this sandwich recipe. Heat a small skillet sprayed with cooking spray on medium-high heat. Add onion; cook 3 min., stirring frequently. Meanwhile, microwave steak and barbecue sauce in medium microwaveable bowl on HIGH 1 min. or until mixture is hot. Place steak with sauce on bottom slice of bread; top with cheese and onion.